During the recent decline, all major indices except for SPX and DJI successfully tested their 50 D-SMA. Although the same tests are not necessary for SPX and DJI in order for the bull run to continue, but it would have been nice if that had happened today. Today, a combination of good initial claims data and short covering pushed all indices substantially higher right from the get go. Looking at the SPX recent price pattern, I'm not sure if SPX broke out of a symmetrical triangle formation (a continuation pattern) and it's on its way to set new highs, or what we see is a bear flag pattern warning of a sell off in coming days. 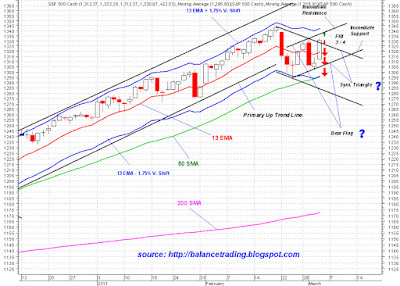 Chances are that it is a bear flag; and odds are good for a major sell off down to 50 D-SMA around mid 1290's starting tomorrow. 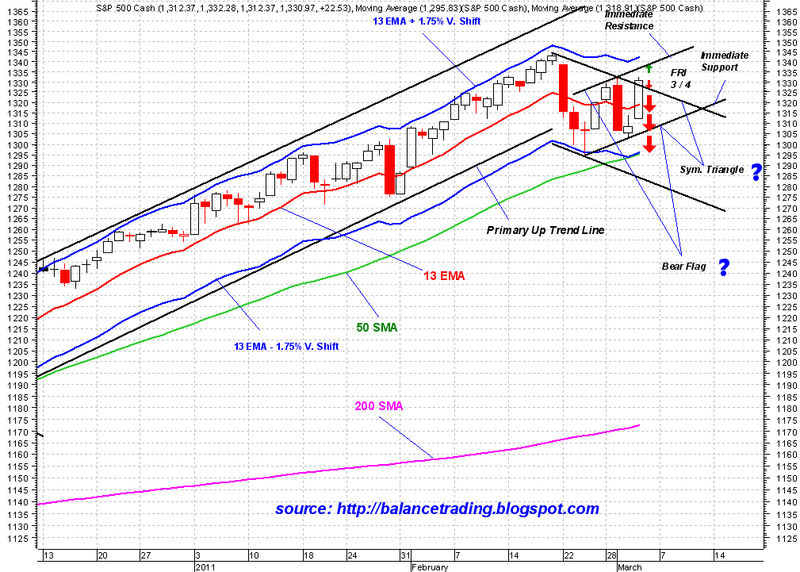 If that's the case and a sell off starts, Market is predicting a news shock coming our way this weekend. If Market rallies tomorrow and sets new highs in at least one or two indices, we're in clear and the bull leg that started on September 1, 2010 should continue.